We ate lots of good food (sorry, no pictures! ): watermelon, blueberries, strawberries, vegetable fried rice, summer salad, bread pudding, a huge spinach salad with avocado dressing, grilled veggie burgers and home-made baked salt & vinegar chips.... The baked salt & vinegar chips turned out great. I got the idea here. We also took the toddler to the "duck park." I call it the duck park because there are tons of birds and ducks, and the toddler has the best time chasing after the ducks and just being fascinated by them. 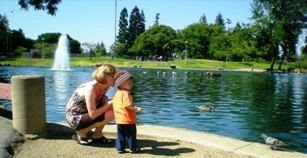 It can be a bit stressful at times as the toddler is usually about to jump into the water and after the ducks... 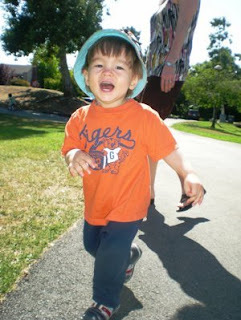 But we (and especially the toddler) had soooo much fun! Questions: What did you do over the weekend? Did you make it to a Farmers' Market? If so, what did you get? I hung out with family and friends the entire weekend, and had a blast! No marketing for me, but I did some grocery shopping and purchased many fresh veggies and fruits! I didn't know you had a son in high school and one in diapers, I love that! I was 13 when my brother was born, so my mom went through the same thing. I love my brother so much, he's actually turning 13 in August!! My how times flies. yummo on the walnut baguette - that looks amazing! your son is too dang cute! The heirloom tomatoes look great - so colorful! Those heirloom tomatoes need to be here with me!!! We're eating our own cucumbers now and had our first tomato yesterday. Summer produce is actually here! I really like the picture of your family, even if you're not thrilled with it. I wrote all about my 4th of July fun on my other, non diet and exercise related blog. Suffice it to say, we were up in Boston and had a great time! I did make it to the farmers market - bought some tomatoes, cabbage, strawberries, and a ton of stone fruit! Oh I think the photo turned out great! The toddler is PRECIOUS!! Ummm, I did make it to what could be considered a Farmer's Market and I bought a cheesesteak(what can I say, I was in Philly!!). I think the pic turned out great! But you are totally right, it's not about taking the most perfect pic (which is what usually keeps from getting family pictures taken) but about the memories you make. Yum! 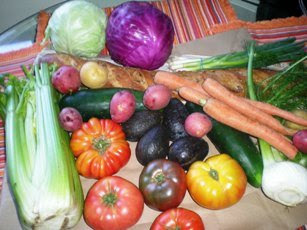 Your goodies from the farmers market look fabulous!! I think your family photo is great! Beautiful family!